James was born on the 1st March 1887 in Manchester. We don't know anything about his family. He attended St Paul's School in Manchester and was a member of the school choir. After this James went to work as a slipper maker at a factory in Shudehill, Manchester. On the 11th November 1903 James began his military career by joining the 6th Battalion of the Manchester Regiment. This was a unit of the Militia, so James kept his civilian job and trained as a soldier for a short period every year. When he enlisted James was 5 feet 1 5/8 inches tall and weighed 100 pounds. He had a 'fresh' complexion, grey eyes and brown hair. He was given the service number 9649. James was promoted to Corporal on the 11th July 1904 and to Lance Sergeant on the 1st August 1907. The Militia was disbanded and replaced by the Special Reserve in 1908, and James transferred to this new force. He became a member of the 4th (Extra Reserve) Battalion of the Manchester Regiment on the 9th August. He returned to civilian life at the end of his 6 year term of enlistment on the 11th November 1909. James married Mary Power in 1905 at St Michael's Church on George Leigh Street in Ancoats, Manchester. By 1911 he worked as a journeyman baker at R. Sharrocks Bakery. He and Mary lived at 67 Jersey Street Dwellings in Ancoats and had 3 children, Annie was born in around 1907, David in around 1908 and Eliza Ann in around 1910. James returned to the military on the 17th March 1913. He joined the 7th Battalion of the Manchester Regiment, based at Burlington Street in Manchester, and was given the service number 1637. This was a unit of the Territorial Force, so again James kept his civilian job. Territorials mostly trained in the evenings and at weekends. As well as his military service, James also became involved in the Boy Scouts. He became an Assistant Scout Master on the 5th February 1914. At this time the family lived at 80 Charlton Street in Collyhurst. The First World War broke out that August and the 7th Battalion was called into service. They left the UK on the 10th September and eventually arrived at Khartoum in the Sudan. James found Khartoum 'a place of wonder and amazement (apart from the heat)'. For a time James was employed as a cook for the British guards at the Sirdar's Palace. This was the home of the Governor -General of Sudan; General Sir Francis Wingate. James left Khartoum on the 10th April 1915 and travelled back to Egypt. He then sailed to Gallipoli and took part in the invasion of this Turkish territory on the 7th May. Almost immediately James came under fire. On the night of the 10th he was with a small party who got lost on the way to the front. 'We scrambled on our stomachs, unable to see where we were going...some of us then made our way scrawling down a small ditch, with rifle fire from our own guns and the Turks passing over us'. In order to get back to the British lines, 'about 100 yards away' James had to sprint 'in a zig-zag fashion. I was spotted by some of the Turks who quickly opened a reckless fire at me. I could see the shots falling on either side but none hit me'. Later that month James rejoined the Machine Gun Section. In this role he would use the Maxim Machine Gun to support infantry attacks. This was not a safe job however. In July 'I had another narrow escape. I was digging in a hole with a mate and as we changed tools he was hit through the neck and it killed him. I was only a few inches from him at the time so I thought myself lucky'. James supported the British infantry as they attacked Turkish positions on the 7th August. The next day 'I had a fine bag at sunrise. I caught a large body of them returning through the open and I opened fire, this roused our artillery...and what I missed they captured'. The fighting continued until the 12th. James received a card of congratulation for his actions during this attack. By this time James held the rank of Sergeant. On the 20th October he was ordered to leave the 7th Battalion and report to the Machine Gun School at Mudros on the island of Lemnos to serve as an instructor. The School moved to Ismailia in Egypt when Gallipoli was evacuated in January 1916. In around April he moved to the Imperial School of Instruction at Zietoren. Whilst he was based here a fire destroyed his tent and all his belongings, including the diary he had been keeping since August 1914. He would eventually become the School Sergeant Major. James left the School on the 10th January 1917. He was taken ill with a fever on the 18th, meaning he had to be admitted to the 17th General Hospital. He was released from hospital on the 1st February and rejoined the 7th Battalion the next day. He was given command of the battalion's Lewis Guns. This was a Light Machine Gun, simpler than the Maxims he was used to. These had been moved into separate Machine Gun Companies. The 7th Battalion sailed to France that March. During this period James was given a new service number: 275210. After serving in the Peronne area he was able to take ten days leave to the UK between the 12th and the 22nd April. On his return he moved to Ephey. German aircraft were a danger. One dropped its bombs on the 7th Battalion positions. James 'opened a quick burst of fire with one of our Lewis Guns. I must have given him a nasty hit because he quickly landed behind us...on examining the plane we found that the engine and machine gun were badly hit by our bullets'. The 7th Battalion moved north to Ypres in Belgium during late August. They guarded the Belgian coast then moved to Ghevelde in France. James thought this was 'the worst place I have ever been in for experiencing bombing raids'. Even on leave in Dunkirk James was not safe. 'while I was sleeping in an Hotel I was awakened by a horrible crash and found that the wall of the room I was in had been blown down by a bomb, my clothing was buried in the debris and ...almost in ribbons...In this Hotel that night there were 7 people killed and 3 injured'. In October 1917 the 7th Battalion moved south to Bethune. This was fairly quiet and 'there was nothing much of a change here till 3 day of March 1918'. That day James went on leave for 14 days. Soon after he returned the Germans launched their Spring Offensive. This led to desperate fighting by British units. James was moved around often 'to reinforce those who needed help'. James spent the summer of 1918 training soldiers to use the Lewis Gun before joining in the Allied advance that began in early August. On the 7th October James was sent back to the UK for 1 month's leave. After this he returned to France, and was wounded by shrapnel. By the end of the war James held the rank of Acting Warrant Officer Class II. He was discharged from the Army as 'no longer physically fit for war service' on the 11th April 1919. He was given a Silver War Badge, serial number 468623, to show that his discharge was honourable. He stayed in France later than many other men from his area, and his daughter remembered that 'everyone else's Daddy had come home' before hers. After the war James tried several jobs. He loved entertaining and joined a concert party. He became a skilful ventriloquist, and even performed his act on the radio! In 1928 James and his family moved to nearby Middleton where he ran an antique shop. There was space for a billiards table and a ping-pong table, so James used to charge local children 1/2 penny each for tea and biscuits, with free games. He called this 'The Vivid'. In the late 1930s another war became more and more likely. James joined the Auxiliary Air Force (AAF) on the 3rd March 1939 and was called up when war was declared on the 3rd September. His AAF service number was 857416. James worked with barrage balloons, which were attached to the ground with cables and intended to force enemy aircraft to fly higher, where their bombs would be less accurate. He served in France before the German invasion of May 1940, and after British troops were evacuated he spent some time working with barrage balloons attached to ships in the English Channel. Later James worked at RAF bases all over England. He stayed in the AAF after the end of the war in 1945 and retired as a Sergeant on the 20th December 1949. He ended his service with Number 91 Maintenance Unit at RAF Cottam in East Yorkshire. They repaired and stored bombs. James was awarded the Air Efficiency Award for 10 year's service. His grandson John was serving in the Army at nearby Catterick at the time, and was able to attend the celebration of his grandfather's award. 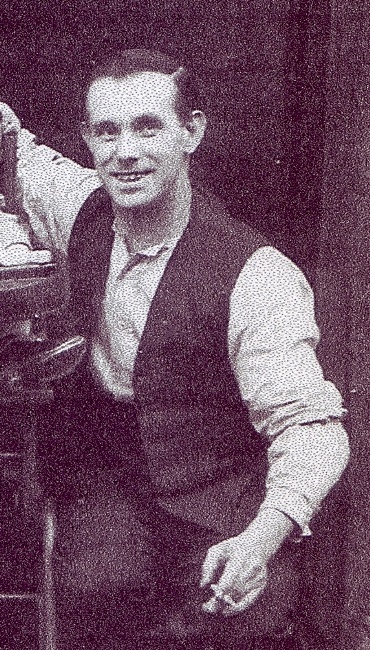 After he left the AAF James went to work for Avro aircraft manufacturers, based in Chadderton, Oldham. He worked in the stores until he retired. During the 1950s Dr Henry Hempling discovered he still had shrapnel in his body. As well as his work, James was a significant figure in the Manchester Regiment Old Comrades Association (OCA). He served on the Committee of the Ashton-under-Lyne Branch when it was reformed in the late 1940s, and attended many reunions and remembrance ceremonies. James was one of 9 representatives of the 7th Battalion who attended the new Queen Elizabeth's Royal Review of Ex Servicemen in Hyde Park on the 5th July 1953. Fred Bamber and James Ruddock, whose medals are also in the Museum of the Manchester Regiment collection, were two of the others. On the journey to London Fred was the only one who could remember the words to the song 'We are the 7th MGs'. Even James had forgotten some of them, and he was the author! James died at home, 25 Dale Road, Middleton, on the 19th November 1963. He was 76. His funeral was held on the 23rd, the same day President John F. Kennedy was assassinated. James was remembered as 'the life and soul of every party, always entertaining... a great character that everybody loved'. His medals were donated to the Museum of the Manchester Regiment in February 2000.